Some people have been asking for this for a while, so I'm finally writing it. I have a severe bilateral high-frequency hearing loss. What does this mean? What does it "sound like" to hear like that? My short answer is that I really can't tell you, because this is the only way I can remember ever hearing so there's no basis to comparison. But I can show you quantitatively and let you figure out the rest. First, in order to more quantitatively understand what I'm talking about, here is a picture of my audiogram. It is basically a plot of the frequency response of my auditory system; in other words, it's a low-pass filter compared to normal hearing, and this picture describes what I can't hear. 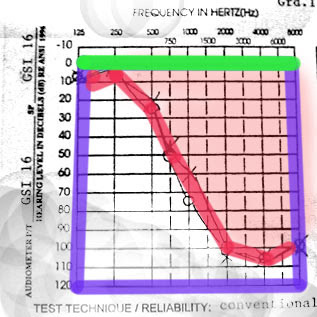 The purple box represents the range of volume intensities and frequencies that a normal person should be able to hear; low frequencies are to the left, low volumes (amplitudes) towards the top. 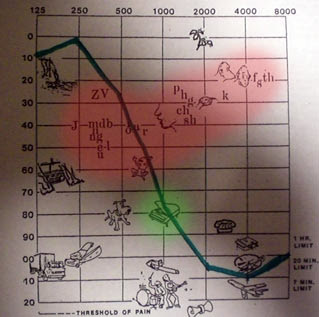 The green line on top is a normal hearing profile - what normal people are able to hear. The dark pink line is my hearing profile. The shaded pink area is what most people hear that I can't. Here it is overlaid on some common sounds. Amusingly, the piano (in green, my instrument of choice) straddles the line squarely between what I can and can't hear. It means that I transpose passages an octave down when I'm practicing sometimes so I can hear if I'm making mistakes. When I was very small, I used to ask my mother to listen to me play and tell me if I was hitting the wrong notes. It also means that oftentimes I can't hear my right hand playing because the left hand's chords (or even the percussive impact of the key mechanism itself) drowns out the actual melody line. I've also blocked in English speech sounds in red. Note the difference between the voiced consonants on the left and the unvoiced ones on the right. Vowels fall under my hearing range, consonants often don't - which is why I have a "deaf accent" but perceive myself as speaking the same way as everyone else. I usually don't pronouncing the high frequencies I can't hear (I am trying to make a habit of it, but it's easy to slip, and it feels really funny when I do it because I'm not used to the air moving that way inside my lips). Most of my friends describe my "accent" as "fuzzy" or "dulled" - well, that's what happens when you low-pass sound. Try talking using mostly vowels and voiced consonants (described below) and you may have a rough approximation of how I speak. This is also one of the reasons lipreading is a pain, because - well, look in the mirror and say the words "big" and "pig." Can you tell the difference? (Try holding your throat with one hand to feel the vocal cords vibrate.) One is voiced and one is unvoiced. Try "key" and "gee," "sip" and "zip", "to" and "do" - and then take a look at this page about Japanese voiced and unvoiced consonants. It was one of the first things that struck me when I studied the language in high school. The only difference between the "t" and "d" sounds (and the other pairings above) as written in Japanese phonetics is the addition of little hash marks in the upper write of the katakana (alphabet) symbol. Hopefully I'll be able to post a file about what it sounds like to hear like Mel soon, if my tinkerings in SigSys go rewarded.